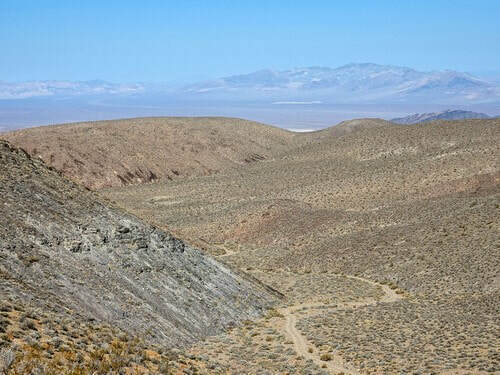 ​This trail goes through Echo Canyon (It really does echo) to visit Inyo Mine, and then continues to come out on US 95. It is a 2.0 rated run as far as Inyo Mine, then the rating increases to 3.0. 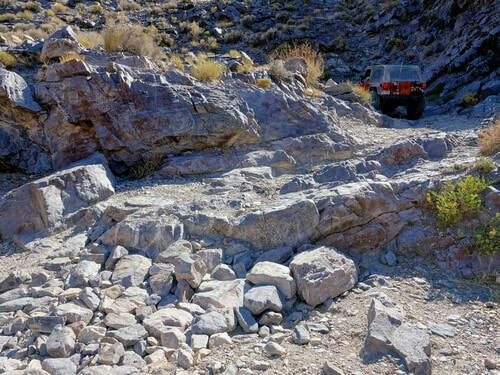 The road is on an alluvial bed for the first few miles, first on an open fan and then on the floor of Echo Canyon. 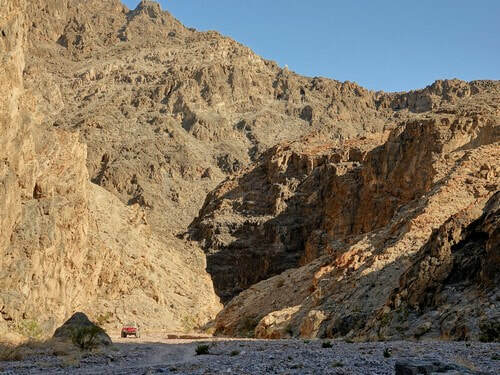 The canyon soon narrows and you are treated to high rugged walls and a serpentine route. Very impressive. Eye of the Needle is close to the canyon floor and you will drive on both sides of it. Probably would make a good photo if someone were to climb up into it. 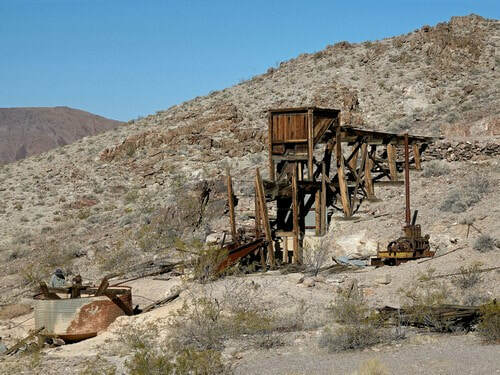 A right hand spur will take you to Inyo Mine with quite a few old structures and and pieces of mining equipment. There is some kind of sorting/processing chute between the high structure and the arrastra that we do not understand. Ore chute, processing chute and arrastra. ​In January of 1905 Maroni Hicks and Chet Leavitt discovered gold here. 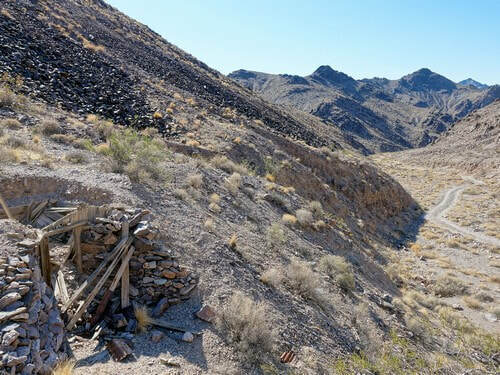 In the next two years dozen of claims were established in Echo Canyon. 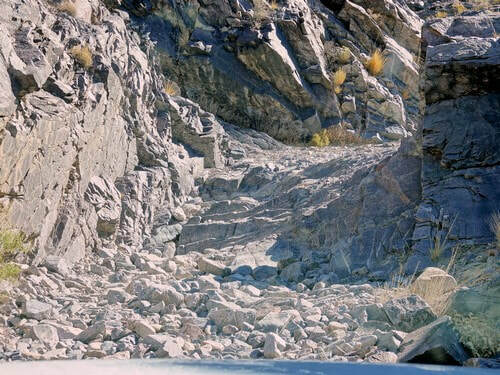 Inyo was the largest in what became the Echo-Lee mining district. Production began in the winter of 1906, most of the ore assayed at $300 per ton with some running as high as $650 per ton. By the fall of 1907 the Inyo had three vertical shafts and 755 feet of tunnels hosting equipment, blacksmith shop, boarding house, and a store. Most of the work was done in the winter months when the temperatures were cooler. In the fall of 1907 attempts were made to raise money through a public stock sale but 1907 was also a year of financial panic throughout the west. In 1912 the owners tried and failed again. From 1907 through 1927 very little work was done and in 1928 the mine was sold. The new owners found themselves victims of the mines earlier difficulties, gold was in the ground, but was costly to extract and water wasn't available for milling. Little was done until 1937 when the mine was leased to the Inyo Consolidated Mining Company. 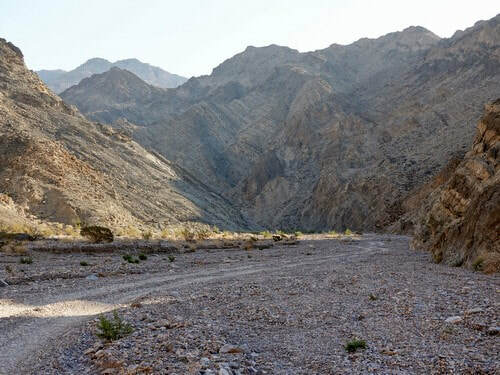 The company then installed a ball crushing mill with a 25 ton a day capacity and began hauling water from Furnace Creek, 8 miles away, and had plans for a pipeline. This would all be short lived, by the spring of 1938 the mine closed due to the lack of water. 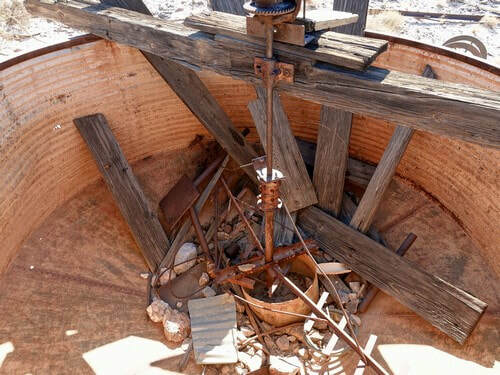 The mine was leased again in 1939 and produced gold at $230 per ton, but the deposit ran out. The last shot was in 1940 with the same results and then closed for good. This must have been a very busy mining district as there are shafts and mining debris for miles up the canyon. A short spur to the right will take you to this one. There are two obstacles in a row that give this section of the trail a 3.0 rating. Take a good look at these photos before you decide to go. A family SUV might not do very well. 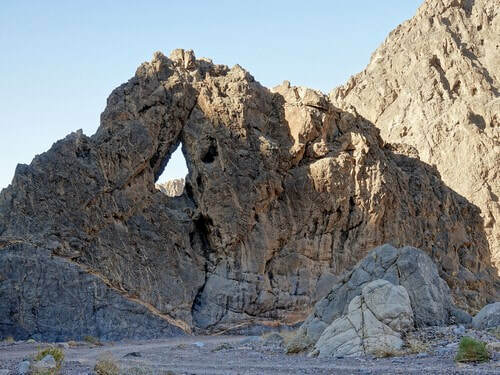 The trail climbs out of Echo Canyon and goes to a high saddle in the Funeral Mountains. Great views from here, and you can see the road you will take to get out. Note the canyon in the middle of the photo - This contains a few 2.5 obstacles that add a bit of interest to the run. 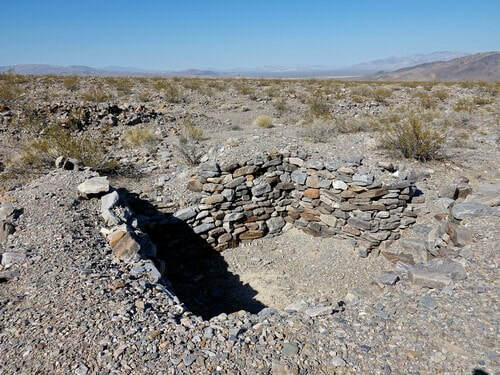 Lees Camp, down on the alluvial fan, has a few foundations remaining. Follow the track to a well graded County road and then to pavement.